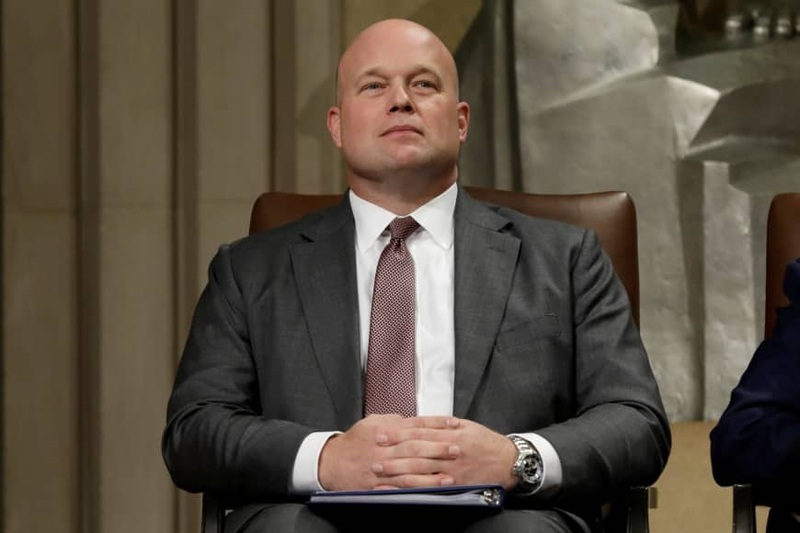 Senators sued Monday to challenge President Donald Trump’s appointment of Matthew Whitaker as acting attorney general. Amid concerns Whitaker was chosen to protect Trump from the Russia collusion investigation of special prosecutor Robert Mueller, the senators said the president violated the constitution by naming him to lead the Department of Justice without first seeking Senate confirmation. “The U.S. Senate has not consented to Mr. Whitaker serving in any office within the federal government, let alone the highest office of the DOJ,” they told the federal court in Washington. “The constitutional requirement that principal federal officers be appointed only with the Senate’s ‘advice and consent ‘… was adopted by our nation’s founders as an important check on the power of the president,” they said. One of the three senators, Sheldon Whitehouse, accused Trump of installing his “lackey” to undermine the Mueller probe. Trump named the former prosecutor and television commentator to be acting attorney general on Nov. 7 after forcing attorney general Jeff Sessions to resign. Many critics believe Whitaker was chosen to insulate Trump as Mueller’s investigation gets nearer to the White House. Last year he repeatedly attacked the investigation as too broad and legally questionable, and called to defund it. Sessions had recused himself from overseeing the Russia probe, handing the responsibility to Deputy Attorney general Rod Rosenstein. Normally Rosenstein, who has gone through Senate confirmation, would have been made acting attorney general until a new nominee could be vetted. But now Rosenstein has had to step aside from overseeing Mueller, leaving that power to Whitaker. The White House and the Justice Department both argue that the appointment was legal. In an interview with Fox New on Sunday, Trump defended Whitaker, but avoided addressing his comments on the Mueller investigation. “He’s a very smart person. A very respected person. He’s going to do what’s right,” the president said. It was the third lawsuit challenging Whitaker’s appointment in one week. On Friday lawyers petitioning the Supreme Court to review their client’s lawsuit against the Justice Department — a case originally known as Michaels v. Sessions — asked the high court to rule on whether Whitaker can legally stand for the department in the case. They said that his questionable appointment could destabilize any federal court case in the country, and said Rosenstein instead should represent the department. “This is the extraordinary case in which the identity of the successor is both contested and has important implications for the administration of justice nationally,” they wrote. “Because Whitaker’s appointment does not satisfy the Appointments Clause, it is unlawful, and he cannot serve as Acting Attorney General,” they said. Three days earlier, the state of Maryland asked a federal judge to block Whitaker from acting on behalf of the department in an ongoing court case on health care policy, likewise arguing that he had not been Senate-approved. “President Trump’s brazen attempt to flout the law and constitution in bypassing Deputy U.S. Attorney General Rosenstein in favor of a partisan and unqualified staffer cannot stand,” Maryland state Attorney General Brian Frosh said.